It was definitely surprising to find this at my front door. An extra large envelope with cardboard back, marked do not bend. The envelope is lacking the usual marking of British Royal Mail, with no Cypher on the back. 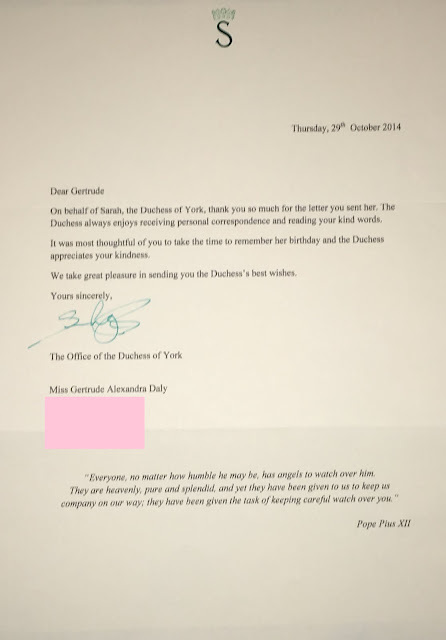 But the little green S at the bottom clued me in on who this was from, Sarah, Duchess of York. This letter is quite similar to last years letter (which I have included at the bottom, as I never made a post about it). One of the interesting things about this is the paper is different from last year. It is a richer cream color, the picture doesn't really show it accurately. Also, the monogram on top is a different color. It's a black S, and it is printed on with the rest of the text, not embossed like other royal letters. The quote at the bottom from Pope Pius XII is the same from past year. It's a really old quote, over half a century. (I wasn't able to figure out when, or where, exactly.) Pope Pius died the year before Sarah was born, so there isn't any personal connection between the two. The letter included a photo of Sarah, mounted on cardboard, and with a printed signatures. The picture is 8 years old, taken from a photoshoot by American photographer Mark Seliger for Vogue Italia in 2007. I would have liked to see a more recent photo, given that Sarah has had tremendous weightless over the last few years, and have very publicly spoken about how she has gotten a lot more confident and healthy recently. It had a similar response time. It was folded and put in a normal envelope since there wasn't a photo included. The signatures on the two letters look similar, so I assume they were written by the same person. Not even tried to write Duchess Sarah, because only the family of Beatrice answered me so far. I think it's a big surprise to you, it's a great photo autographed by hand. Hi - Love the blog - so interesting. 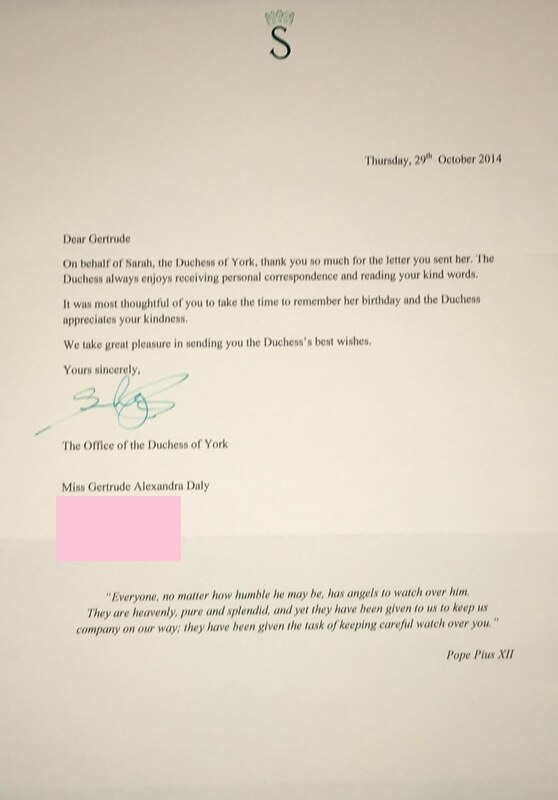 I'd love to see the letters and photos from Sarah, Duchess of York.